Scientific research and education share, at their core, the systematic pursuit of knowledge. As an educator and research mentor, it is my goal to both impart knowledge and illuminate the process by which knowledge is gained. I believe it is this process that empowers students to become scholars who seek out and critically evaluate information. I strive to create environments in which diversity enhances learning and scientific ingenuity. In the same way that natural selection acts on biological variation to select the best solutions, I think diversity is critical to scientific progress: finding the best answers to modern biological questions relies on the ideas of people from diverse backgrounds, identities, and life experiences. My early work experience in special education has been central to developing my pedagogical approach: content is best communicated using multiple sensory modalities, with an emphasis on hands-on, student-driven learning. I strive in every student interaction to together assess understanding, recognize progress, and identify the next logical and feasible challenge. I have continued to develop as an educator, gaining experience at The University of Texas at Austin, Agnes Scott College, Georgia State University, and the Newfound Harbor Marine Institute. At Georgia State, my excellence in teaching was recognized with two awards: I received the Graduate Award for Outstanding Instruction in 2012 and the Steven Kudravi Memorial Award for Outstanding Introductory Instruction in 2013. Preparing for a squid dissection at the Newfound Harbor Marine Institute (Big Pine Key, FL) by making a list of student-generated questions to answer. 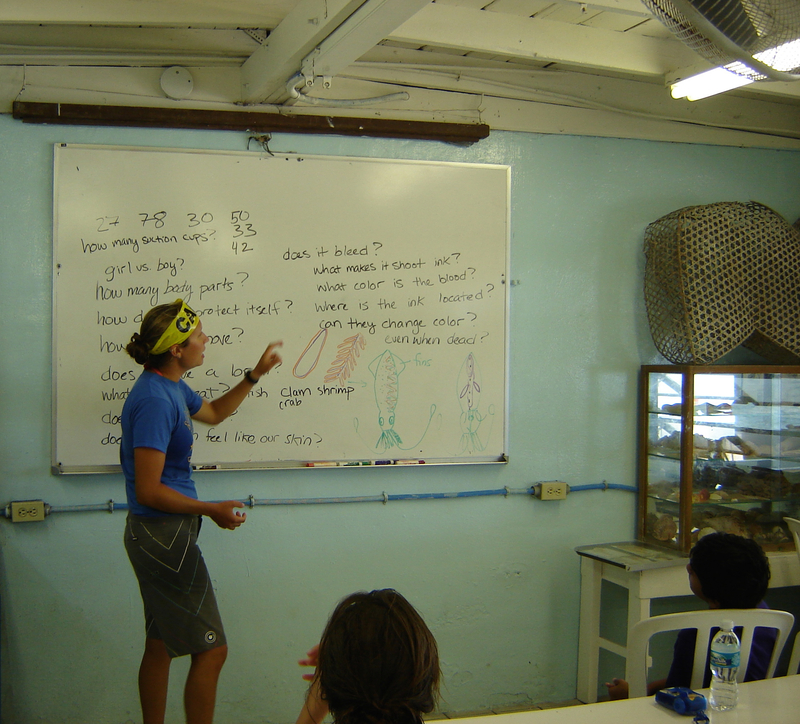 Teaching about coral ecology and biology before the students snorkel (Newfound Harbor Marine Institute). Using Play-Doh coral polyps to demonstrate how neighboring corals interact (Newfound Harbor Marine Institute).